Jimmy Hill: "Don't sit on the fence Terry. What chance do you think Germany has of getting through? Terry Venables: "I think it's 50-50." 'I would not say he (David Ginola) is the best left winger in the Premiership, but there are none better'. (Ron Atkinson). Aristotle, polymath, philosopher and key figure in development of western civilisation. From the fourteenth century, there are definitely ballads that refer to a character, known as 'Robin Hood'. These ballads were surviving in the 15th or early 16th Century. They depict an outlaw who was in conflict with the law, an in particular, the Sheriff of Nottingham. In the medieval period, the names Robin and Hood were both very common. Looking at registers, there are many people called Robin Hood. Some of these Robin Hood's were also wanted by the law. It is quite likely, these ballads were based on a real person, who exhibited, at least, some of the characteristics we associate with the modern version of Robin Hood. It would be very surprising if there wasn't a real person who was in conflict with the law and the then Sheriff of Nottingham. However, these early ballads were often vague about details and specifics of Robin Hood. Over the Centuries, play writes, authors and movie producers have added and adapted different characters and ideas to the legend of Robin Hood. It is likely that the Robin Hood referred to in the early ballads was not a dispossessed aristocrat, but just a yeoman, which was basically a commoner. These early ballads also placed Robin Hood in the thirteenth or fourteenth century so he wouldn't have had any national political role such as supporting King Richard III. In a way Robin Hood has become a symbol of a character we would like to idealise. Someone fighting injustice, standing up for women and the poor, being loyal to the rightful King, being physically strong and skilled. 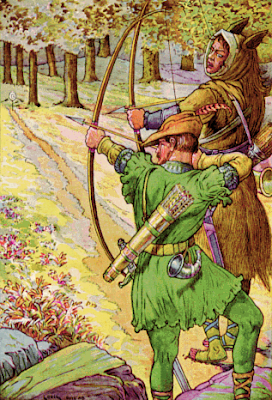 Writers have had full scope to create Robin Hood in their own image. But, back in history, there would have been someone with at least some of these attributes and characteristics. One thing is certain, that there is no historical 'Robin Hood' who is recorded as doing everything portrayed in movies. If someone had played such a key role in leading Saxons to revolt over Normans (1937 Errol Flynn) he would have had greater historical mention. Also many ideas such as Maid Marion, Friar Tuck, were conveniently added many centuries after Robin Hood was first mentioned. Maid Marian was not associated with Robin Hood, until the book, Thomas Love Peacock in 1822. However, though modern versions have added colour, ideas and characters, there are still certain similarities with early versions and perhaps the real Robin Hood. Robin Hood is still a man of his time seeking to create a better life, amidst the injust and cruelty of those in power. Beethoven was a composer of extraordinary versatility and genius. It is hard to pick his greatest works, but these are some of the best known and most famous pieces. Symphony No. 9 in D minor, including well known "Ode to Joy".